Pet Health and Safety < Does Your Dog Have Motion Sickness? Does Your Dog Have Motion Sickness? “Help! My dog can’t ride in the car without getting sick!” Does this sound like something you would say? Many animals suffer from motion sickness which can turn a fun and exciting car ride into a messy and unpleasant experience for all. Whether due to an imbalance in their inner ear, feeling stressed, or a negative association with motion, if your pup continues to throw up or display signs of motion sickness you may want to consultant your veterinarian. 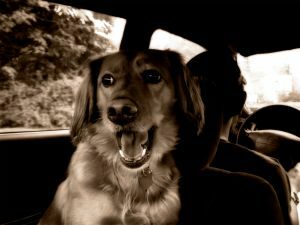 Medication is often possible to help your pooch tolerate the drive better. Furthermore, a certified dog trainer or behaviorist can help desensitize your dog to the car and provide some training tips designed to prevent an upset tummy. No one dog breed is more or less prone to motion sickness, and it can develop at any age. So the next time you hit the road, make sure to pay attention to your canine pal and look for the signs. Treatment is available and your pup will surely enjoy traveling with you the better he feels along the way. For more on motion sickness, what it may come from, and what to do about it, click here!